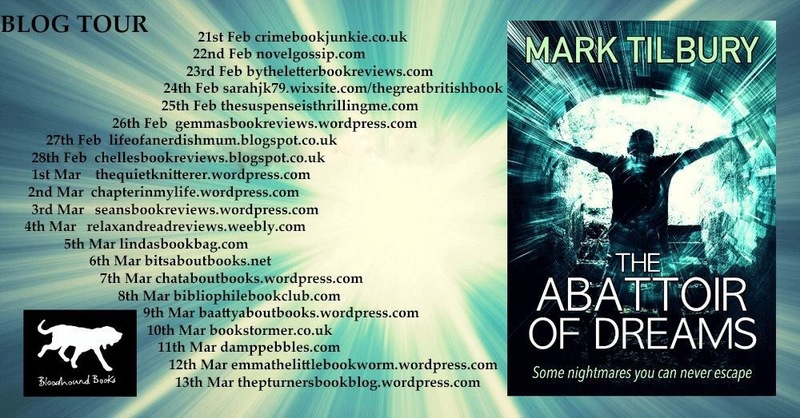 Today is my turn on the blog tour for Mark Tilbury’s The Abattoir of Dreams, published by Bloodhound Books. I get to share my review with you all, but first here’s the bookish info you need to know! Mark Tilbury is a new author to me so I had no idea what to expect when I started reading The Abattoir of Dreams. I’m always apprehensive when I read a new author as I never know if I’ll get along with the author’s style, but I needn’t have worried. Mark Tilbury has written a very interesting thriller. We meet Michael Tate, in hospital after waking from a coma, and he is the prime suspect in the murder of his girlfriend. Becky was found stabbed to death in their flat, and Michael is paralysed and suffering from amnesia after attempting suicide. When he is visited by Detective Inspector John Carver, he is informed that he is charged with her murder. Michael has had a traumatic childhood. His father murdered his mother and is in prison. The reader also learns that Michael was a resident at Woodside Children’s Home, and it was far from a happy place to be. I found the chapters dealing with Michael’s past to be the most harrowing and emotive in the book. These chapters will send the reader on a journey and you will be put through the emotional ringer. The Abattoir of Dreams deals with a few themes, the most prevalent being murder and abuse. I found that although it was tough and uncomfortable to read about, the author has done a good job of dealing with it honestly and sensitively. The author has shown just how horrific and depraved some people can be, and the lengths to which they will go to get what they want. The Abattoir of Dreams is a gripping thriller, and I will definitely look out for more books from this author. I just love the premise of this book 🙂 I’m glad you enjoyed it! Thanks Donna! It’s a very interesting read!